Happy Monday everyone! 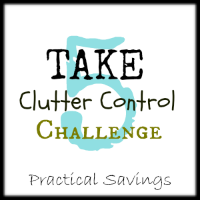 We’re almost done with the Take 5 Clutter Control Challenge! You can see the posts of Day 1, Day 2, Day 3, Day 4, Day 5, Day 6, Day 7 and Day 8 of the challenge, if you’re just joining us, and complete them at your own pace. Are you ready for Day 9? We’re going to take each room in the house like this. While you might decide to get rid of more, the point of this challenge is to be quick, giving us a jump start into decluttering. I might do a more intense declutter challenge later and we will be tackling organization along the way, but for now, just Take 5 and start there.